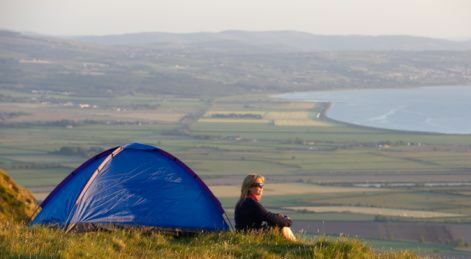 There are numerous camping and caravan parks to choose from in the wonderful country of Ireland and it’s a great way to explore the lovely countryside and enjoy some fine outdoor activities. Some of the grounds are in rural settings and others are close to towns, tourist attractions, and outdoor activities. Some of the campgrounds offer campers minimal facilities, such as the space to pitch a tent or park a caravan along with washrooms, water and electricity. Other parks and grounds are a little more upscale and offer additional things such as shops, markets, on-site restaurants, swimming pools, laundry facilities, and activity centers. These are quite common for family holidays in the summers. You don’t have to worry about being bitten by rabid animals when camping in Ireland as the country is rabies free. Dogs from Britain are allowed in the country without being quarantined, but all other animals are forbidden. Don’t worry if you don’t happen to own a tent or caravan as several campgrounds rent out fully-equipped motor homes and caravans. These are generally rented out by the week and are quite affordable, especially for families. Most of the grounds are ideal for tents, caravans, motor homes, hikers and motorcyclists, and hikers. You’ll need to take the right camping gear with you though, if you want to completely enjoy the experience and make sure it’s a safe one. Make sure you take along a compass, lantern, flashlight, batteries, pocket knife, rope, a tarp, whistle, water jugs, and a first-aid kit. It’s also a good idea to take a cell phone if you have one. It can rain quite a bit in Ireland, so if you’re tenting make sure that it’s waterproof and you pit a tarp under it on the ground to keep dry. An inflatable air mattress might be a good idea and don’t forget sunglasses, fire kindling, and cooking utensils. The scenery in Ireland is fantastic and since it’s surrounded by water there is a lot of coastline. However, most of it is of the rugged and rocky variety; not the sandy-beach type. Because the country is so beautiful, it’s tempting to camp out in areas that aren’t controlled or regulated. If you do camp anywhere other than a commercial campground, make sure you ask for permission first from the landowner. If you’re allowed to camp on their property make sure you respect it and clean up afterwards.